Aldes Bath Fan Kit With Multi-Port Exhaust Fan and 3 Grilles. 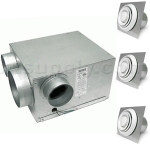 6" Fan with (2) 4" and (1) 6" Grilles- MBFK-AG-3 - 251 CFM - Ventilate 3 rooms with 1 fan! This Bathroom Fan Kit brings commercial grade ventilation into your home!! Ventergy Series® in-line ventilator fans represent years of engineering development to combine the energy efficiency and sound performance of a forward curved fan, with the durability and pressure characteristics of a backward inclined impeller fan. The included grilles / mounting sleeves assembly includes a backdraft damper to keep outdoor air from entering your bathroom. This kit is perfect for ventilating two bathrooms with one fan - or one large bathroom where multiple exhaust pick-ups are required. (1) Switch, which could be a timer, motion sensor, dehumidistat, etc. The MPVS 150 or 200 Multi-Port Ventilators are highly versatile continuous duty fan units that can be used for residential and light commercial applications. ENERGY STAR rated for low energy consumption, these are most popular for central intermittent exhaust of bathrooms, kitchens, and laundry rooms. For a perfectly balanced system - consider using Constant Airflow Regulators (CARs) to provide just the right amount of ventilation in each space. The principle advantage of the MPVS central exhaust system is the elimination of standard noisy bath fans, with the obvious benefi ts of quiet operation and reduced penetrations to the exterior of the building. In addition, with the increased tightness of construction for energy effi cient buildings, there is a growing need of mechanical ventilation for indoor air quality. These fans are designed to serve this purpose as well, by providing effective bathroom ventilation, with the ability to run intermittently or continuouslyas needed. The quiet, energy efficient permanent split capacitor external rotor motor has permanently sealed bearings that provide many years of maintenance free performance.